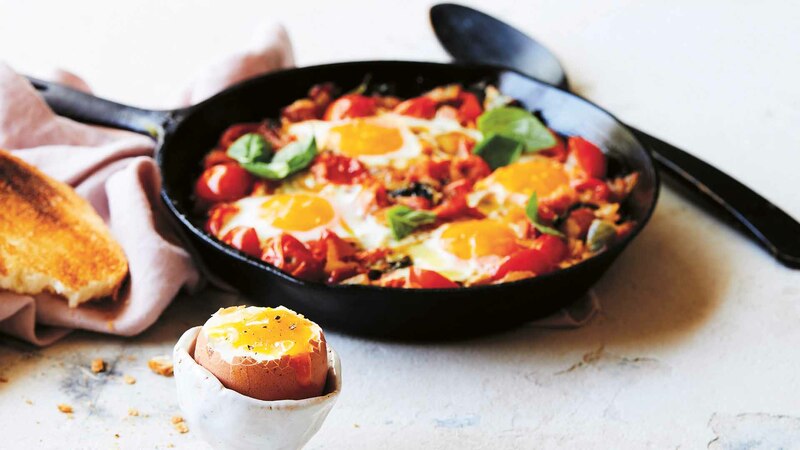 A warming weekend breakfast, full of energising protein. 1. Heat a splash of olive oil in a deep frying pan over medium-high, add the onion and pancetta and cook for 5 minutes or until golden. Add the tomatoes, salt and half the basil and simmer, stirring occasionally, for 8–10 minutes until a thick, sticky sauce forms. 2. Reduce the heat to low. Using the back of a spoon, make four indents in the sauce, then crack the eggs into the indents. Cover with a tight-fitting lid and cook, untouched, for 5 minutes or until the eggs are cooked to your liking. 3. Finish with a generous splash of olive oil, scatter with the remaining basil and serve with the toast. Recipe extracted from The Doctor's Diet by Dr Sandro Demaio, available now from Pan Macmillan Australia, RRP $34.99. Dr Sandro Demaio trained and worked as a medical doctor at The Alfred Hospital in Melbourne. He currently co-hosts the ABC TV show Ask the Doctor.